Fulton County Humane Society co-owner Tracey Wanners, holding a calico named Ginger, wants to help reduce the area’s stray cat population. Tracey Wanner had to pause to calculate how many stray cats the Fulton County Humane Society must turn away each month for lack of space. She said the answer – between 30 and 40 – is both frustrating and heartbreaking. 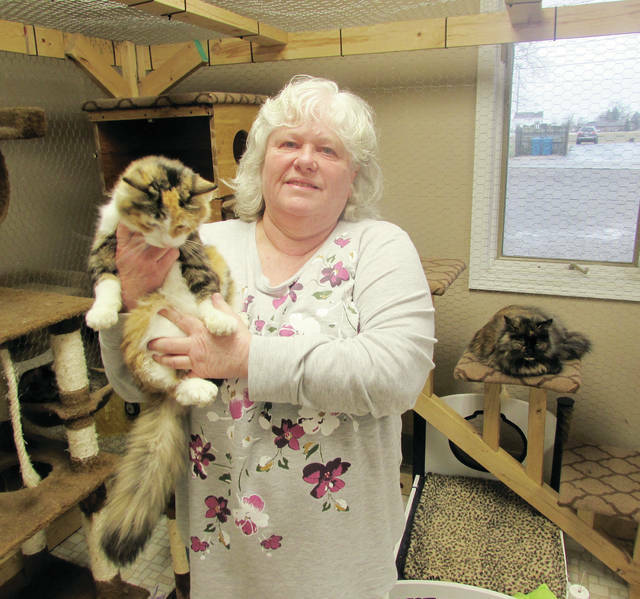 As co-owner and cat intake coordinator of the Humane Society, at 14720 County Road J, Wanner can testify to what she calls a huge problem of stray and feral cats in Fulton County. She said she’d love to save them all but has room for only 30 at a time. And those spaces are reserved for those that are sick, injured or in a dangerous situation. The Humane Society, which operates entirely on donations and adoption fees, presently houses 24 cats. Of those, three are being held temporarily for their owners, several are pregnant, one is nursing a litter of four kittens, and one is suffering from a broken paw that healed badly and is protected by a sock. All that are adoptable will be kept until that occurs, at a cost of $75 for a kitten under four months old and $60 for those that are older. The adoption fee covers spaying or neutering, testing, worming, and vaccinations. Wanner said feral cats are not welcome due to their wild nature. Cats considered not adoptable due to behavioral problems are fixed and treated, then placed on cooperating local farms, where they’re fed and live on the property. Wanner said a cat is euthanized only if it’s so sick or injured it can’t be treated, and those cases are few. Don Fogel DVM, a veterinarian at Northwest Veterinary Hospital in Delta, said people who bring in stray cats are referred to the Humane Society or to the county’s animal control officials. “It’s not uncommon to see them, but it’s not every day,” he said. The veterinary hospital has no capacity to treat feral cats, and will treat a stray cat only if there’s an arrangement with the person who brought it. Occasionally, a stray cat may be euthanized if it’s in dire condition and an owner can’t be located. And while people are well-meaning trying to help strays, Dr. Fogel advised that they don’t mix them with their pets if they bring them inside. He said the chance is too great they could transfer infectious diseases or parasites. He agrees that cat overpopulation is a definite problem, although some animal agencies make an effort through programs to reduce the numbers. The Fulton County Humane Society is one of them. Once each month the facility transports about 30 cats to Humane Ohio. The non-profit clinic in Toledo offers members of the general public the opportunity to have a pet cat spayed or neutered for $47, or a stray cat spayed or neutered and inoculated against rabies for $29. Each stray cat getting the service receives an “ear tip” – a harmless procedure that permanently angles one of the cat’s ears to identify it as fixed. As a further solution, Wanner has spent the past month trying to organize a TNR – Trap/Neuter/Release – program in Fulton County. It would use trained volunteers to set and monitor humane traps in mobile home parks, neighborhoods, apartment complexes, and farms to catch strays. All those captured would be transported to Humane Ohio for spaying or neutering, then brought back to the county and released in the same place they were found. She’s searching for program funding and for volunteers with a few hours to spare each week. Interested people can call 419-349-3841.